A few years ago, I went to a classical violin concert at the Wigmore Hall in London. The music selected was the kind you tend to get on Radio 3, slightly weird, postmodern, and lacking any discernible melody. I was absolutely bored out of my mind until the end when the violinist played Massenet’s Meditation from Thais. Given that the vast majority of the concert had been oozing in self-congratulatory modernity, this seemed to say, “See! 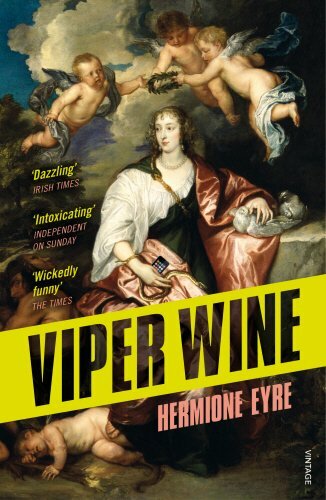 I do indeed have talent!” I felt precisely the same way about Hermione Eyre’s Viper Wine as I did about that concert. Although this book wasn’t a good fit for me, I do recognise the good points. There were certain sections in the book that indicated that Eyre can write beautiful historical fiction *when* she sticks to it (I’ll elaborate more in a bit), and I really do hope that should she write another in the future, that she keeps it true to the time period fully. Some passages were like that Massenet piece, shimmering and beautifully crafted, in the midst of what I can only describe as chaos. Those who enjoy postmodern literature will probably love this book, but that’s not my cup of tea, and furthermore, I don’t think this would be enjoyed by those who favour standard historical fiction. Apparently, the Observer called this book, “dazzling”, the Independent on Sunday said it was “intoxicating”, and The Times described it as “wickedly funny” (did we read the same book?). I – lamentably – found it pretentiously verbose, oftentimes boring, and, at times, at or bordering on the ridiculous. I know this comes across as harsh, something I try to avoid in my reviews, but I think I have good reason. Eyre’s Digby is a kind of hipster who eats Spam and meditates like a modern-day yogi (I was half expecting him to start listening to Chill on his Internet radio and pop into Whole Foods for some quinoa and a wheatgrass smoothie). His age-and-beauty-obsessed wife, Venetia, seems less like the Venetia Digby of history and more like a Housewife of Beverly Hills stuck in the seventeenth century and searching for the latest fad to help her cling onto her fading beauty. The book gives off a sort of smug vibe, especially with the overblown vocabulary (seriously, it sometimes felt like a thesaurus was used constantly). A large vocabulary is generally commendable (A.S. Byatt is one example) but when the reader has to keep a dictionary open whilst reading the novel, that’s too much. The author also felt the need to insert herself into the story, which I thought rather odd, but the inclusion of Naomi Campbell in a cameo role and quotes from actresses and fashionistas was very off-putting for me. Are we seriously supposed to take what so-called “celebrities” say as though they are pearls of wisdom? I have no time for celebrity culture, and found these little modern quotes annoying and unnecessary. There were so many blatant anachronisms that would make other seventeenth-century devotees cringe. Among the things seemingly crowbarred into the story: LED screens, 20th-century pop songs, DVDs, Java code, and the aforementioned Spam (I mean, seriously, SPAM?). I suppose that being as intensely focused on the seventeenth century as I am, these things irritate me more than they would other readers, but I nevertheless couldn’t forget about my own research. In 2015, I had the pleasure of going through some of Kenelm Digby’s work involving pirates, and I did write about his wife, Venetia Stanley, in The Stuarts in 100 Facts, so I was already well acquainted with their stories and her death, rumoured to have been caused by her consumption of viper wine. I think the author’s point is that women throughout time have been going to great lengths to achieve and maintain beauty and youth, but this isn’t exactly a deep topic. To sum up, this book is the literary version of postmodern art: different just for the sake of being different, and ultimately unsatisfying. Thanks for saving me the time, Andrea. However, any time you want to share about Kenelm’s pirate writings, I’d be thrilled. Thanks, Sally! I don’t have any plans to write about it, but I do know that Steve Garnett is currently researching the State Papers 71 (Barbary States) which involves Digby, and I hope he’ll publish his work when he’s done! I’m glad it wasn’t just me that thought all this, I honestly thought I’d missed something what with the cover reviews it has had. I like my historical fiction to be just that and not blended with the modern world. Thanks, Beverley! You know I don’t often write negative reviews like this because I try to see the positive in every work set in the seventeenth century, but those modern elements really ticked me off! I was very disappointed and somewhat dispirited when this book appeared on the Walter Scott shortlist the year it was published. In my book it isn’t HF. And as for the reviews – to me this seems an example of ‘Emperor’s New Clothes’ If you can get on the bandwagon of the big newspaper reviews it appears you are ‘made’ Even more concerning regarding anachronisms – I even heard/ read a comment by the author something along the lines of because she was blending the modern and historical world that she didn’t have to worry about anachronisms or inaccuracies. Now that is seriously sloppy. I was at the WS event when the book was described and an extract read – it almost destroyed my faith in the competition – are they just following whatever is the current trend or do the shortlisted books all have merit? I’m no longer sure. As result of that event I chose not to waste my time reading the book. Thanks, Margaret. I am dismayed by the amount of fanfare that surrounded this book. I am of the opinion now that awards are just given to whoever is flavour of the month. Andrea, you are a fount of information. Thank you for your passion for the 17th century. Also, that book sounds horrid.